I’ve had a look through this spring’s catwalk trends and I wasn’t overly impressed. Same old recycled styles, yawn. That’s why, this year I’m setting my own trends. I’m even more excited to announce that there’s not a floral piece in sight! 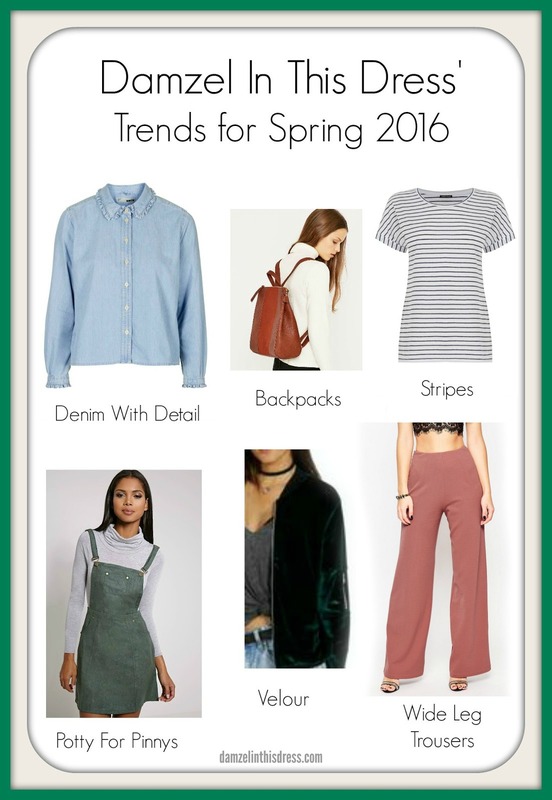 Here’s my round up of Damzel In This Dress’ spring trends and some of my favourites picks from the high street. Wide Leg trousers – Not gonna lie, ever since I saw Hanna on the new season episodes of Pretty Little Liars working those palazzo’s it reignited my love for them. I have a pear shaped body and bigger thighs than I would like but I love how flattering wide leg trousers are on me. This particular pick is from Asos and I’m loving the colour. I’ve had a look online and there are a huge range of different colours and prints available across all the high street and online store websites. Potty for Pinnys – Pinafores are slowly creeping into all the high streets and I’m definitely loving it. This year I’m going to be pairing mine up with vibrant t-shirts, stripey tops (see below) and even bold print blouses. The key to make this trend look a lot less ‘boarding school girl’ and a lot more super chic is all in the length. Find a length that works for your body shape and height. The beautiful green pinny featured is from Pretty Little Thing. A website I have yet to order from but this dress (it is a dress right?) is making it hard for me not to get started with filling up my basket. Denim with Detail – I’m probably going to do a seperate post on this very soon, well actually I definitely am because whilst researching for this post I found some amazing denim pieces which had small details on them that made them look so cute. This particular shirt that I’ve picked is from Topshop from their Moto range. Priced at £32 it’s actually a great investment piece. Denim never goes out of fashion and having tried this on in store I can tell you that this one in particular can be worn in so many different ways. I can’t wait for pay day to come round so I can get my hands on it! Backpacks – I know you know this one already but I am loving backpacks. Not the huge frumpy, looks like I’m about to camp out in the middle of the room kind, but the super stylish ones. The one featured is from Urban Outfitters and also comes in black. See how awesome it looks on here. Stripes – I’ve always been told to stay away from stripes. Apparently they make you look bigger than you really are. To that I say, who cares. They’re in every single high street store at the moment and I’ve just bought my first one (featured above) from Boohoo. Stay tuned to see how I work it. Velour – Yep. I said it first. Velour is going to make a come back this season. Mark my words.